← Reviewing, progressing and starting. Well its been a wee while, hasn’t it lol. We got some dry weather recently and I took advantage and painted the house, this was one of my bigger summer jobs to be done so I am pleased its finished and out of the way now. First off I completed James gift. You’ll remember from my last post I’d only just started it and was working on it while he was away for a few days then when he got home I worked on it late at night so I was very pleased that it remained a secret and a surprise as it was worth it this morning looking at his face when he saw it. ! I also worked on an exchange piece which I will show you as soon as it is received. 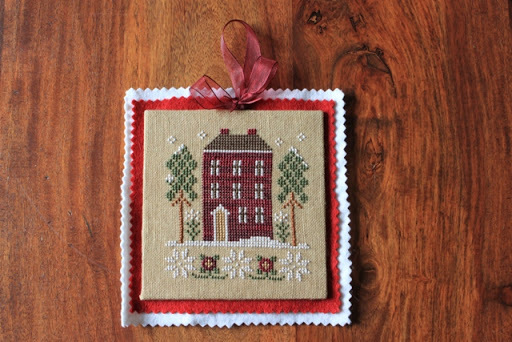 I made up my first Christmas Ornament, the red house LHN one I completed some weeks back. This is going to be part of a Christmas present for my brother, check out my knitting blog to see the other part of his present for now. For my Friday Night Ornament SAL I’ve now moved onto the LHN Fa La La ornament and this is my progress so far. 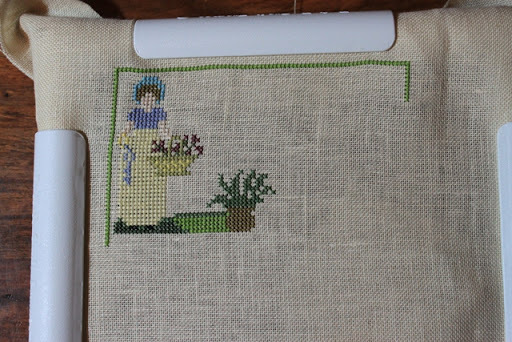 I don’t have any progress on my other SAL’s as I need to order some threads for those so while I’m waiting for those I took out another folly piece, my Mrs Darcy Sampler by The Sampler Girl so I have some progress on this to show you. Well I hope you’ve managed to make it this far in the post and I do appreciate it if you have, do feel free to leave a comment as I do enjoy very much reading them. The Wizard is great!And I'm sure your brother will love the christmas ornament. Love the finishes Ruth! James must be pleased as punch! I've done the wizard as well. And I found out there's a companion piece with a sorceress as well. I made it for my boyfriend while I was working in CO for the summer. I finished it and sent it to get framed and then he dumped me over the phone (what a jerk). So, I wasn't about to give him it so it hung in my room for awhile and eventually, I gave it to my friend Luke and his wife Jen who like it. 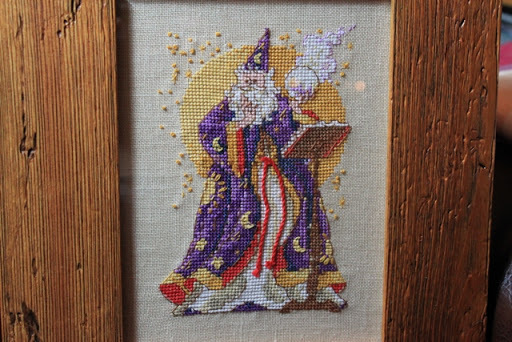 I also have the same Wizard to stitch in my Crazy January Challenge that I'm making for a friend. It's great to see it finished and framed! It's always fun to surprise someone with a gift that they never saw you stitching on. Great job! I love the wizard. 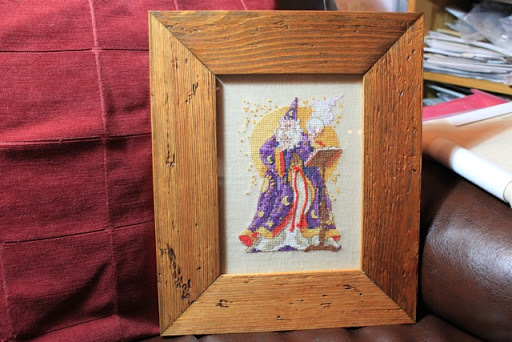 I stitched the sorceress companion piece years ago, but I never did do the wizard. Would you be able to tell me the kit name and number? 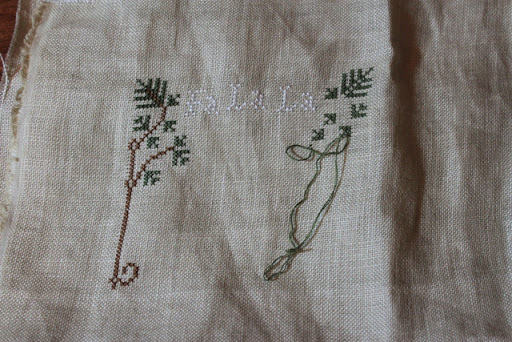 (silverlotus@gmail.com) Your other stitching looks fabulous too! That Wizard is just fantastic! Anyone would be pleased to receive that!Lovely ornie finish.